This is our last full day on the island. Yesterday we rented a Jeep and drove all over the island, stopping at one gorgeous, white sand beach after another to snorkel or just sit and read. Today’s plan is some pool time and then a trip to the W’s spa, then dinner at Mix here at the resort. It was one gorgeous beach after another, all to ourselves. 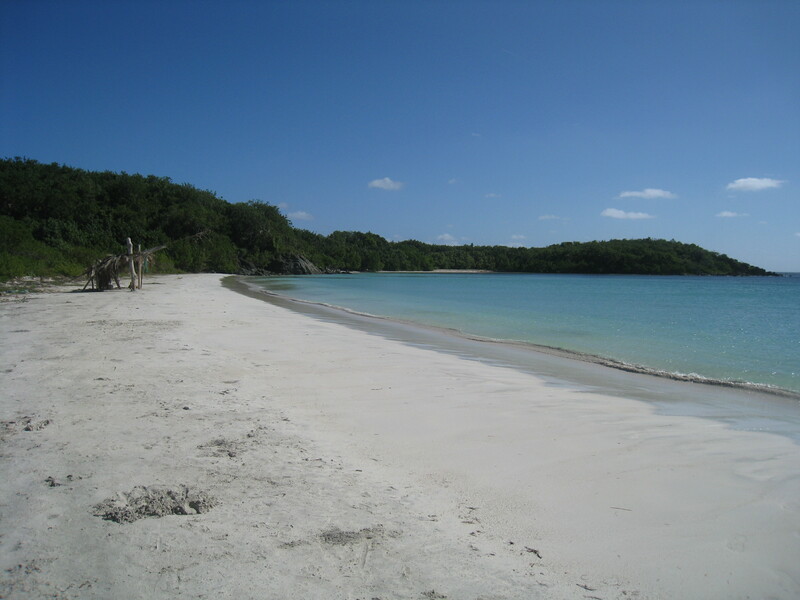 Vieques was used by the U.S. Navy as a bombing and testing range until 2003. 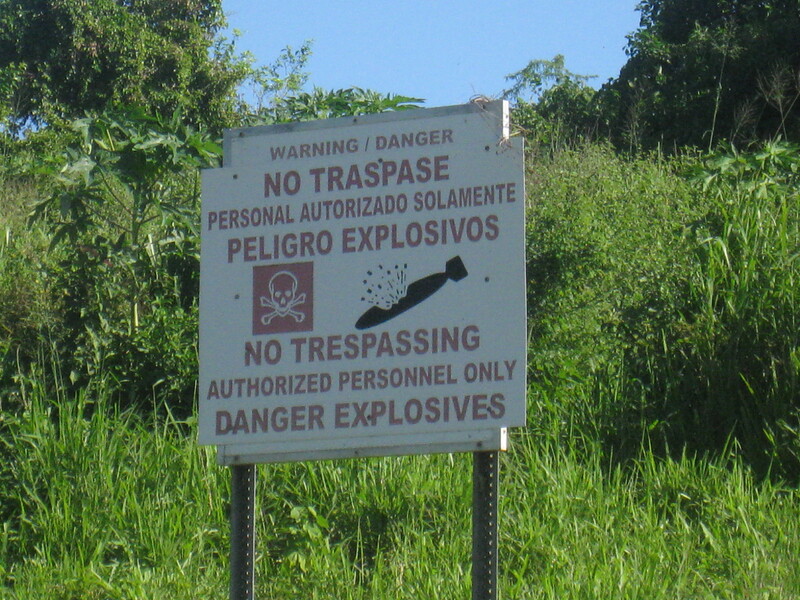 And there are apparently lots of undetonated explosives on parts of the island, which leads to interesting signs such as this one. I think this might be a bad place to snorkel. 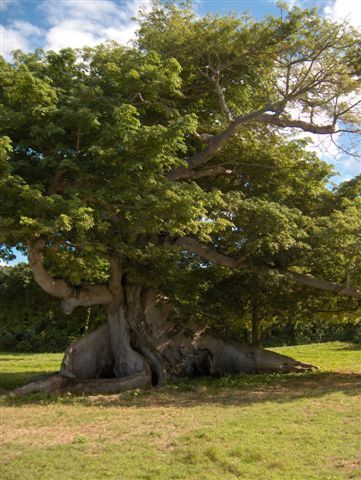 The oldest tree on the island is more than 300 years old. It’s a ceiba tree, which is the state (? territorial?) tree of Puerto Rico. Only slightly older than me. The leatherback turtle, which can be seen in these waters, is gigantic and has to eat its weight in jellyfish every two days. Too bad we never saw one, especially on the day that XFE got stung by a jellyfish while we were diving. There are 20,000 horses and 8,000 human inhabitants. These horses are everywhere. They’re like the Puerto Rican version of Irish sheep. If you know what I mean. What I’m saying is, they’re everywhere. Along with chickens. There are chickens running wild in the streets. There are no stop lights on the whole island. People just pay attention and stop at intersections to give way to oncoming traffic. It’s madness! Madness, I tell you! Also: mofongo is the most delectable and delicious thing ever. I’ve eaten it everytime I’ve seen it on the menu, and might eat it again before I leave Vieques. Totally opposite from Washington D.C., no wonder you are savoring it. 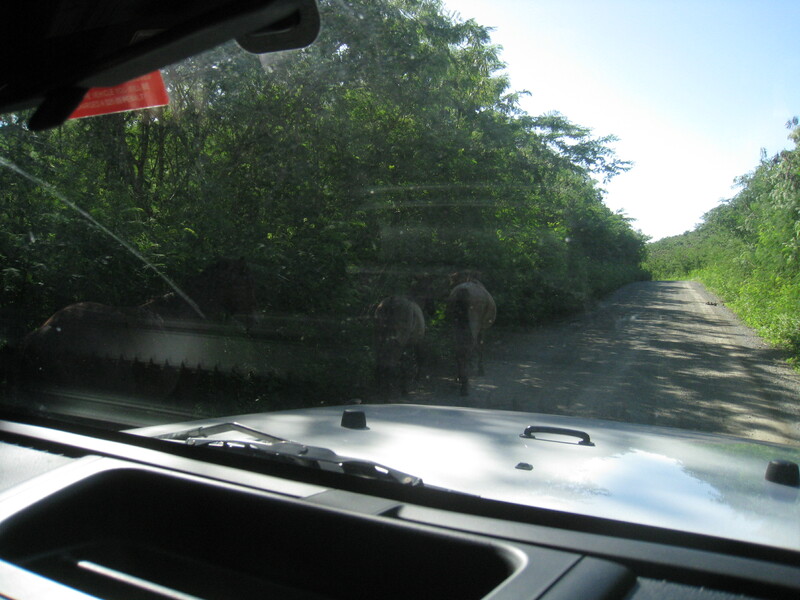 I’ve been to Vieques many times and there’s NO WAY there’s 20,000 horses on that island. Maybe 2000 max. If there were 20,000 you’d never be able to drive, shop or walk because there would be horses EVERYWHERE ALL THE TIME. It seemed like a lot to me as well, but that’s what the Internet tells me.